Training Frequency- How Often Should You Train Each Muscle? This is the time of the year when everyone sends you Holiday greetings and messages on how to slow down, unplug, enjoy life, etc. Well, this newsletter is not one of those outlets! We care about one thing and one thing only: gains. 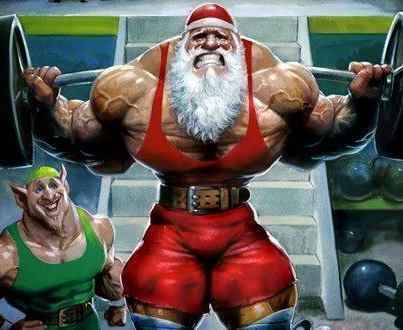 Christmas or not, gains need to be made. How often should you train each muscle? Anyone who knows a little bit about me should be aware that I think the traditional “every muscle once a week”-split is non sense. The reason being that you are leaving too many sessions on the table by under-using you time. Muscles can recover within 48 hours, so you can train your chest more often that just on national chest day, aka Monday. Personally, I think that anyone should train their whole body twice within a week. You need to establish how much time you can dedicate to training per week. So, if you only have two hours a week to train, that would put you at two whole-body workouts for the week. More advanced trainees should consider something like a upper/lower body routine, which would put you at four training sessions a week. If you are truly dedicated and have the time, look into my all-time favorite push/pull/leg combo, taking you to 5-6 workouts per week. For this level of intense training you’ll need to have at least one year of experience, as well as a very solid handle on your diet. Smaller muscles can be trained up to four times a week. One of the best things I ever did for my arms was to do pull ups at every workout. Just start training them for God’s sake!!! Previous post: Clusters- Not Just For Breakfast! Next post: Steady state vs high intensity cardio- which one rules supreme for fat loss?